As much as I like playing in the snow, Spring is the time I really enjoy being outdoors. Seeing everything sprouting and the smell of Spring blossoms in the air are evidence of a fine year ahead. The outdoors invites activity to blow off the energy stored up over a cold Winter. I will take garden work, stocking firewood, or walks in the woods over time on a treadmill any day. 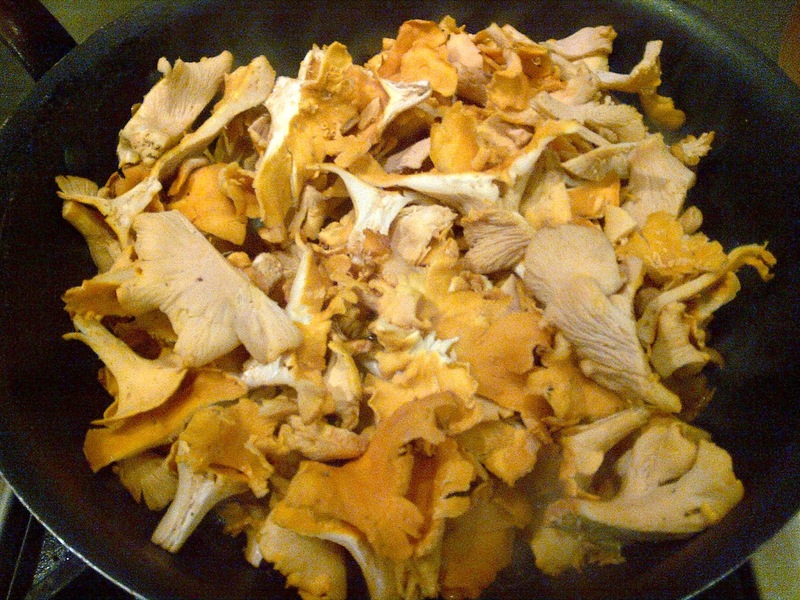 Gathering wood and taking a brisk walk in the forest brings to mind one of my favorite things to eat: Mushrooms! I have been interested in mushrooms and an avid eater of mushrooms for as long as I can remember. About 20 years ago, I decided to try growing Shiitake mushrooms. They were so easy to grow and so tasty, I dreaded going back to the bland, white supermarket variety. I quickly moved into the woods to identify and taste several safe to ID varieties. I started with varieties of Boletes, puff balls, Honey mushrooms, Chicken of the Woods, Hen of the Woods, Chanterelles, Morels, and oyster mushrooms. Don’t ask me where or when to find them. Mushroom foragers live by two rules: (1) When in doubt, toss it out, and (2) Do not tell anyone, ANYONE where your spots are. I read an interesting psychological study about mushroom hunters sharing info, and it turns out they ALWAYS lie. 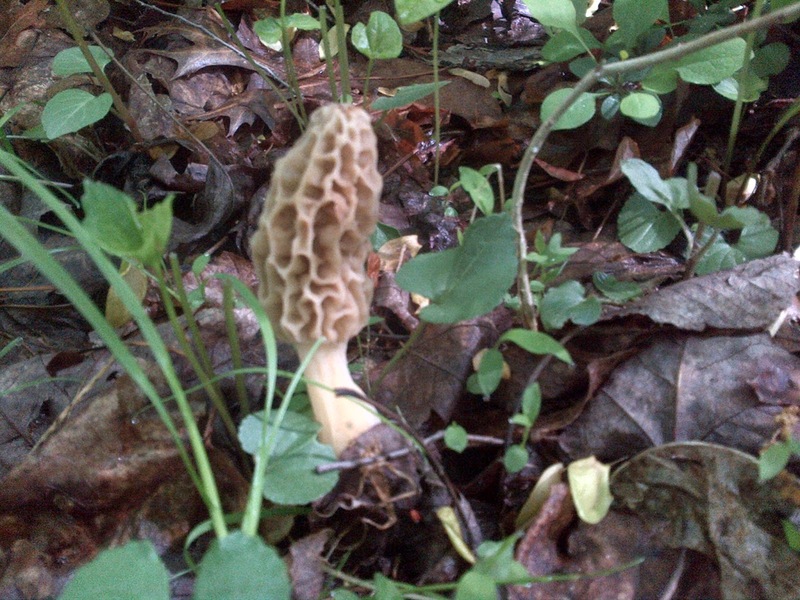 Responsible mushroom foragers take great pains not only to hide their spots, but also to harvest them so that they continue to produce year after year. It is heartbreaking to wait all year for a harvest to find that a favorite spot has been decimated by wildlife (they eat mushrooms, too), logged or cleared for building, posted as private property, or washed out by a flood. Each wild harvest spot must be cherished as a treasure. I will tell you how to grow mushrooms. Shiitakes are very easy to grow, they taste great, and are much better (and cheaper) than ones you will find in your grocery aisle. Having a wood-fired barbecue, a wood-fired pizza oven, and a wood burning fireplace insert, we burn a lot of wood at our house. I am always looking for good firewood. For growing Shiitakes, oak is the best wood. You need freshly cut wood. If it’s been sitting around for a while, it is already loaded with decaying fungus. I read that healthy live trees have an immune system that fends off fungus, so the wood does need to sit for a week or two after cutting before planting your mushroom spawn. When I see an oak tree being cut, I stop and talk to the tree guys. I ask if I can have a load of wood branches that are 5-8 inches in diameter and 3-4 feet long. This is a good size for Shiitake because the logs are small for firewood and easy to move around or stack. I purchase plug spawn from Fungi Perfecti, a small business run by one of the world’s foremost mycologists, Paul Stamets. The spawn is grooved dowel rods that have been inoculated with Shiitake mycelium. The spawn is grown on grain, so you will see some pieces of grain in the pouch. The trip in the mail bruises the fine hairs of the spawn, so let the pouch sit for a day or two undisturbed to allow it to get happy again. Set up a power drill with a 5/16” bit. Wrap a piece of tape around the bit at about 1/8” more than the length of the spawn plugs. This allows the plugs to be driven in flush with the bark of the log and leaves a small pocket under each plug where moisture will be trapped and help growth. Drill a row of holes about every 4-5” the length of the log. Rotate the log 60-90 degrees and drill another row. Continue until the log is covered with holes. Pound a spawn plug into each hole. Some folks seal the plugs with a dab of wax, but I have found it does not make a big difference. When all of your logs are done, place them on the ground in a moist shady spot. I put ours in a patch of trees with a natural forest floor viewable from our deck. If your weather is dry, it helps to put a sprinkler of the logs for a few hours the first few days. I normally just let nature take its course at this point. 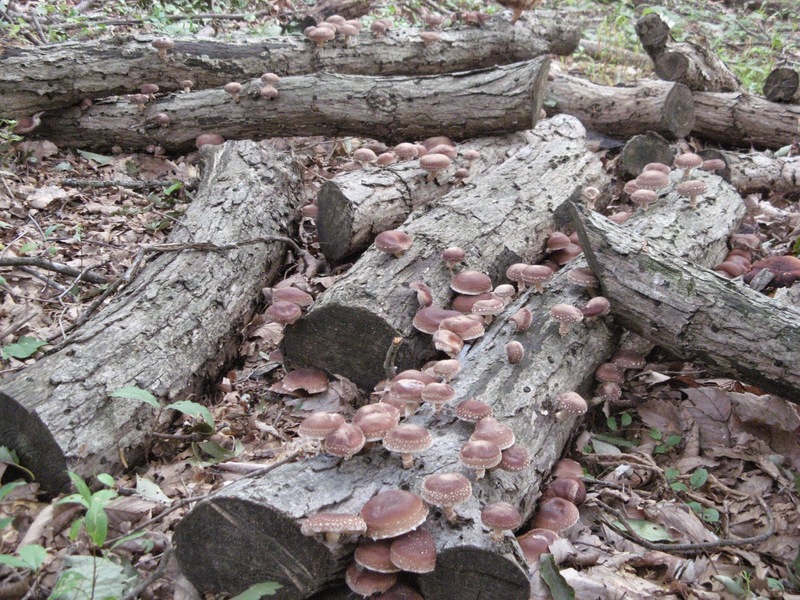 Mushroom logs set out in the Spring may produce a crop of mushrooms that Fall after a big rain when the night time temperatures are in the 60’s. Then for about 5 or more years you will continue to get crops every Spring and Fall when the weather is cool and wet. Every few years, I put out more logs to ensure continuous crops. I buy 1000 plugs at a time, so when there is a big crop, it is up to 20 pounds of mushrooms. 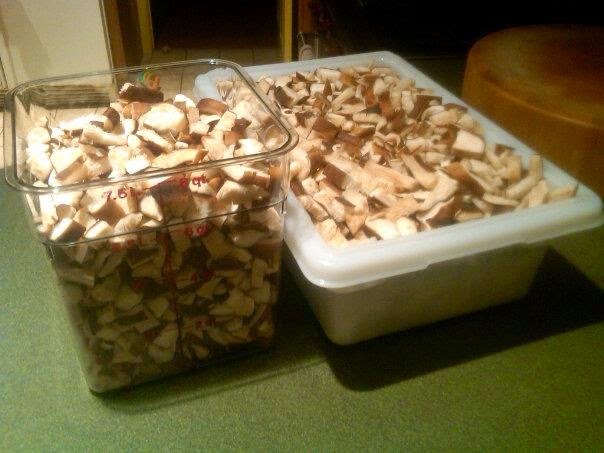 What in the world do you do with 20 pounds of Shiitakes?? The first thing is to eat a lot of them. They store well under refrigeration. Large caps are great stuffed with crab imperial and broiled, or sliced in thick slabs and breaded and fried with similarly prepared slices of squash and green tomatoes. Those crispy fried mushrooms, squash, and tomatoes are great to dip in hot sauce, and make a fine meal paired with fresh sliced tomatoes and corn on the cob. Shiitakes also freeze well. Remove the stems and slice the caps about ¼” thick. Working in batches, heat olive oil and butter in a large pan. Add mushrooms to cover the bottom of the pan. Add some salt. As soon as the mushrooms release moisture, take them out of the pan and spread them on a parchment lined half sheet pan. Continue with more batches, adding more olive oil and butter as needed. When the sheet pan is full, cover it with plastic wrap and put it in the freezer. (You can skip this is you have a chamber vacuum sealer because you can then seal bags with moisture.) Repeat with more half sheet pans until all mushrooms are prepped this way. I keep track of how many mushrooms I prepped. For example, if I prepped 8 pounds of fresh mushrooms, then I want to divide the par-cooked mushrooms into eight freezer bags. Or maybe do some with 1/8 of the total (one pound fresh equivalent) and some with 1/16th of the total (1/2 lb. fresh equivalent). Regardless, turn out the frozen sheet pans of par-cooked mushrooms and cut it into the desired number of pieces, package the pieces for the freezer. Now I have mushrooms ready to go in an instant. I use these frozen packs for risotto, for my Thanksgiving stuffing (along with some boiled chestnuts), as pizza toppings, etc. 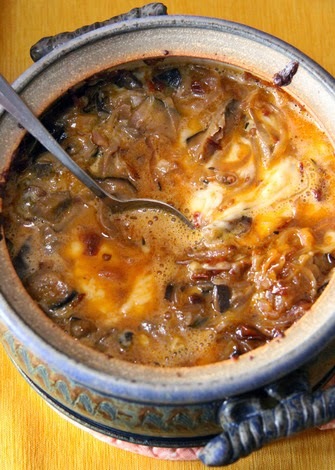 One of the favorite ways to use these mushrooms is to make queso fundido. Mix all ingredients in a bowl. Season with a little salt and fresh ground black pepper. Transfer to an oven safe ceramic casserole. Place in 350-400F oven and bake until the cheese is melted. Stir with a spoon. Serve with warmed corn or flour tortillas.